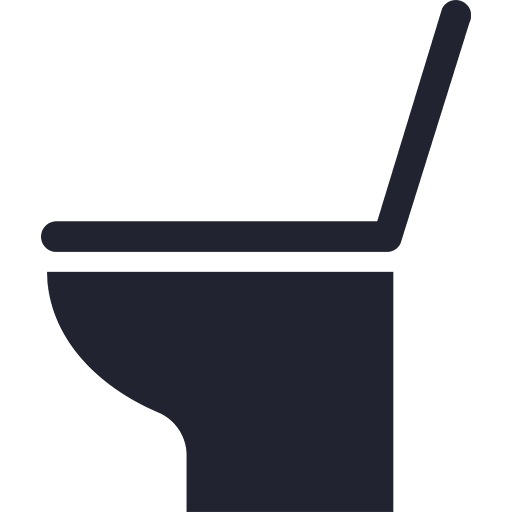 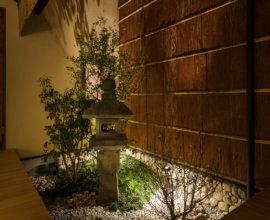 If you would like to make a group reservation for 7 or more guests, please contact our staff directly. 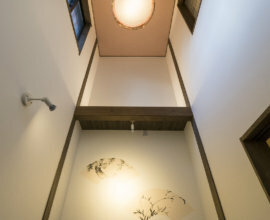 Nihon Buyo refers to various forms of classical Japanese dance, which is notable for being stylistic and dynamic, yet calming, and beautifully expressive. 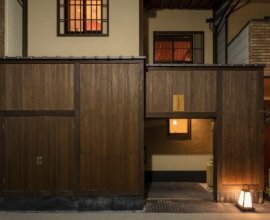 "Fujinoma" machiya house is built upon the former residence of Fujima Kannsei (藤間勘紫恵), a well-respected nihon buyo dancer --injecting even more history and intrigue within this beautifully renovated house. 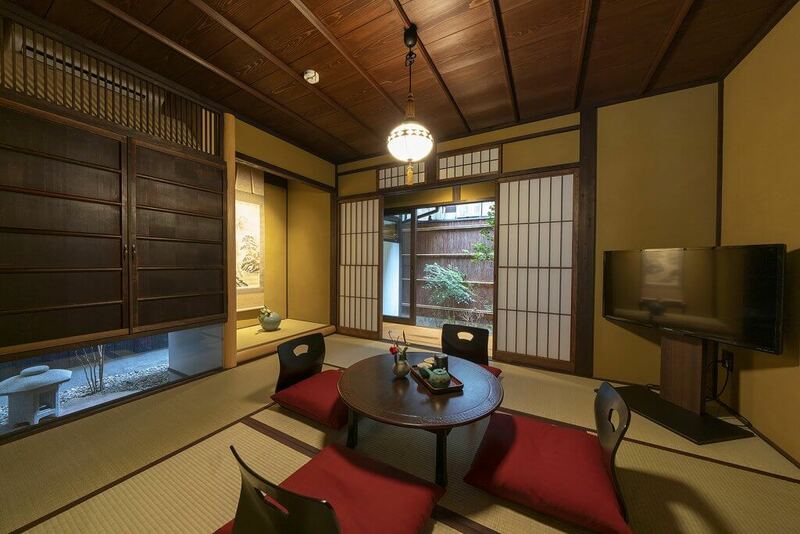 Appreciate dance motifs featured in the machiya's design, such kimonos and fans during your stay. 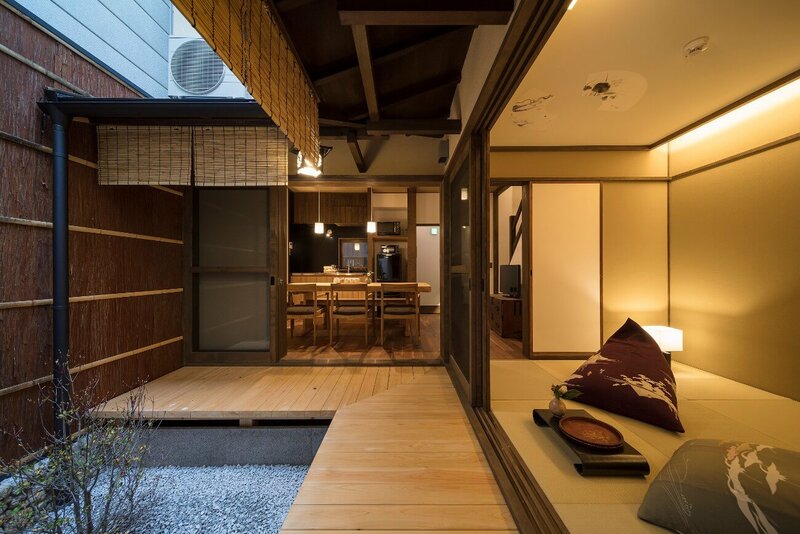 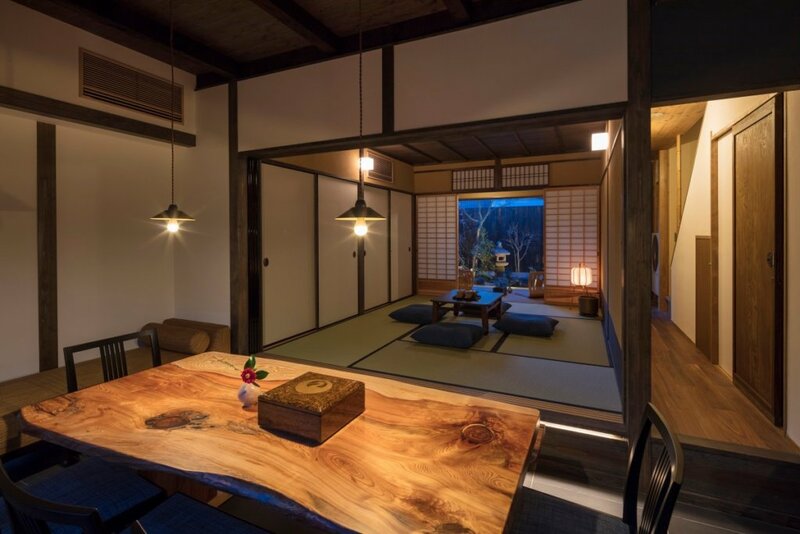 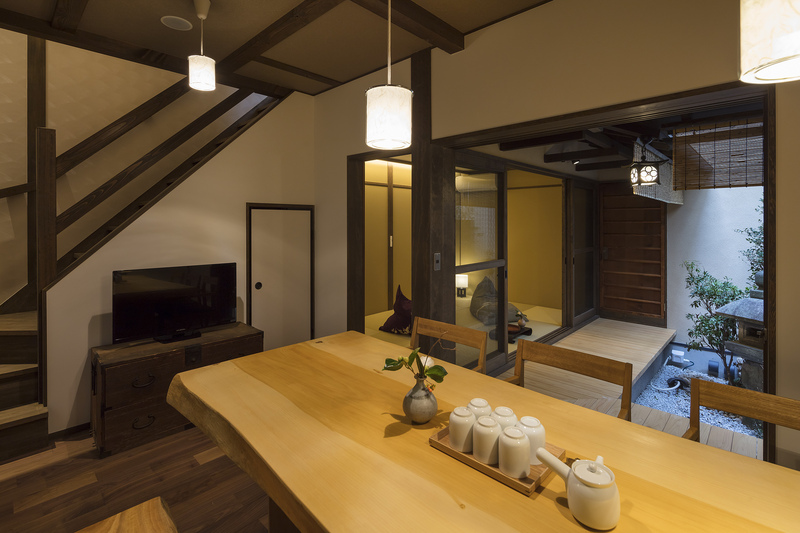 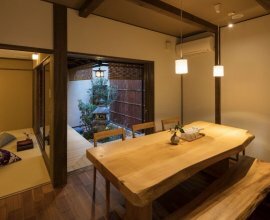 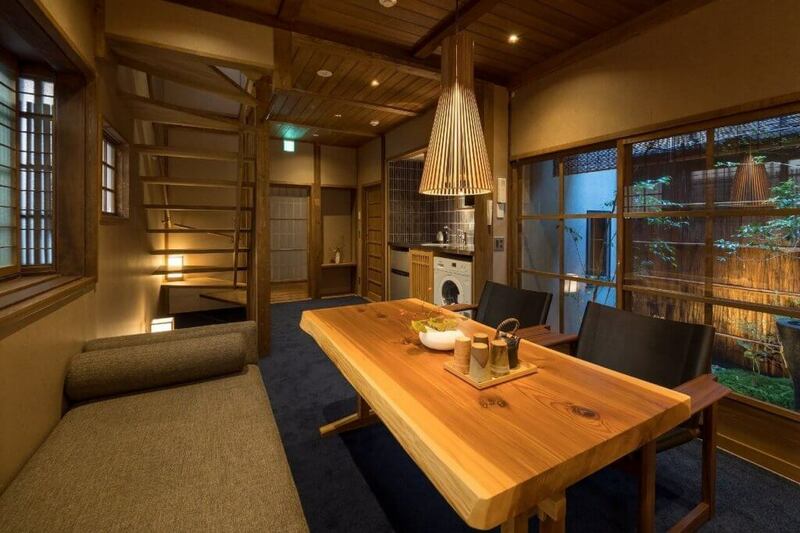 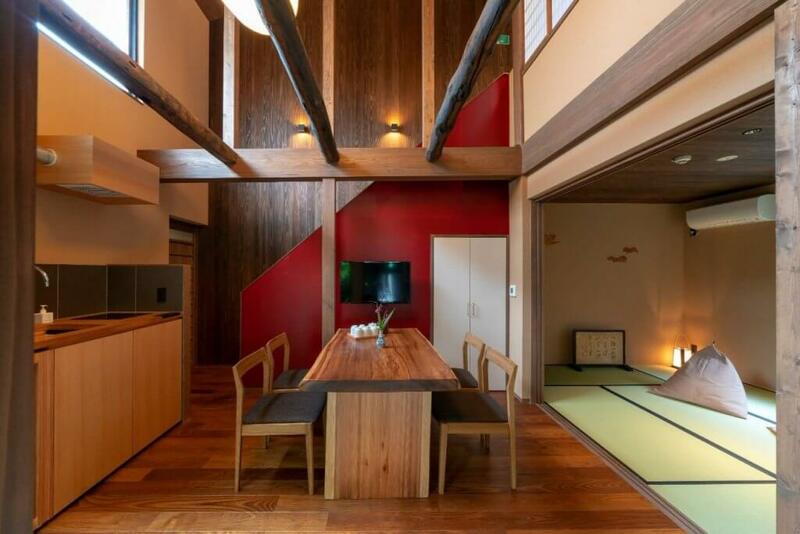 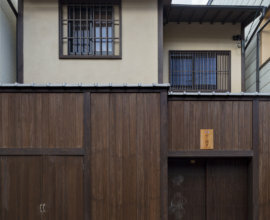 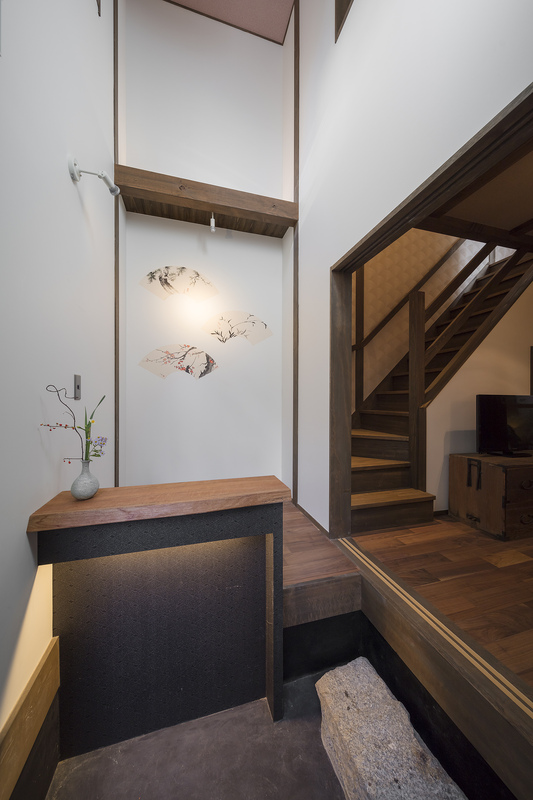 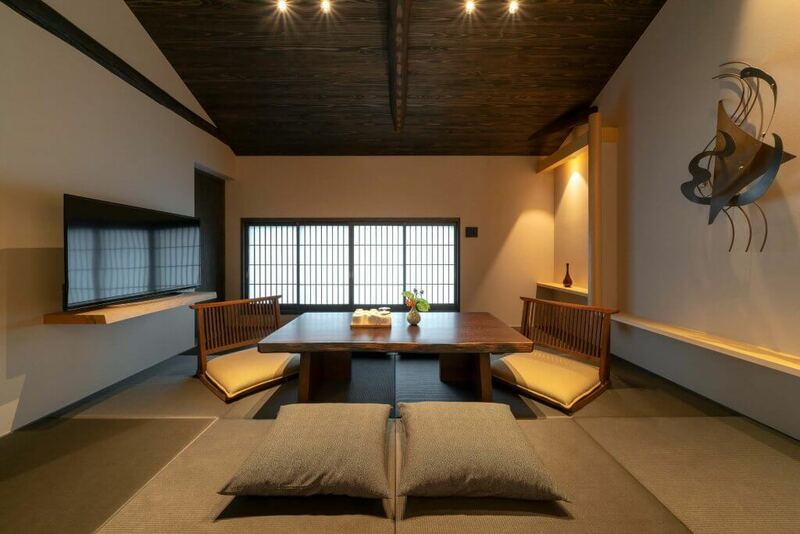 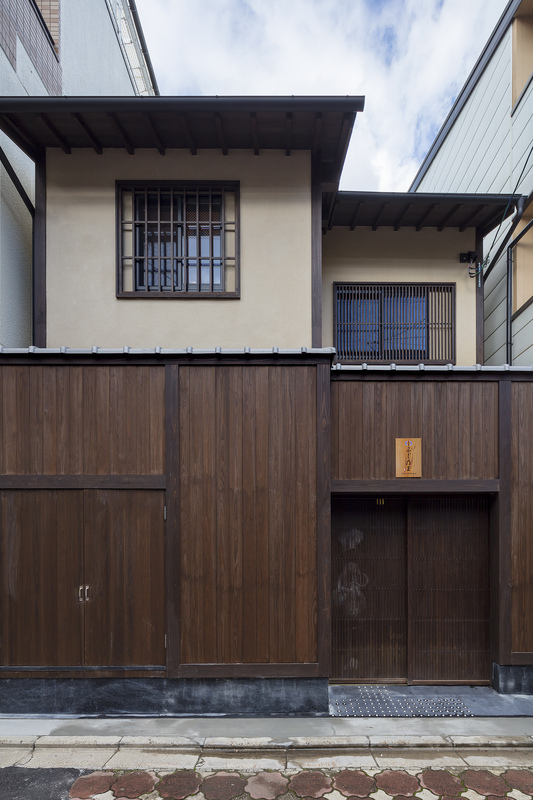 Centrally-located on a quiet residential street, "Fujinoma" machiya house will remind you of Kyoto's colorful history while enjoying modern comforts. 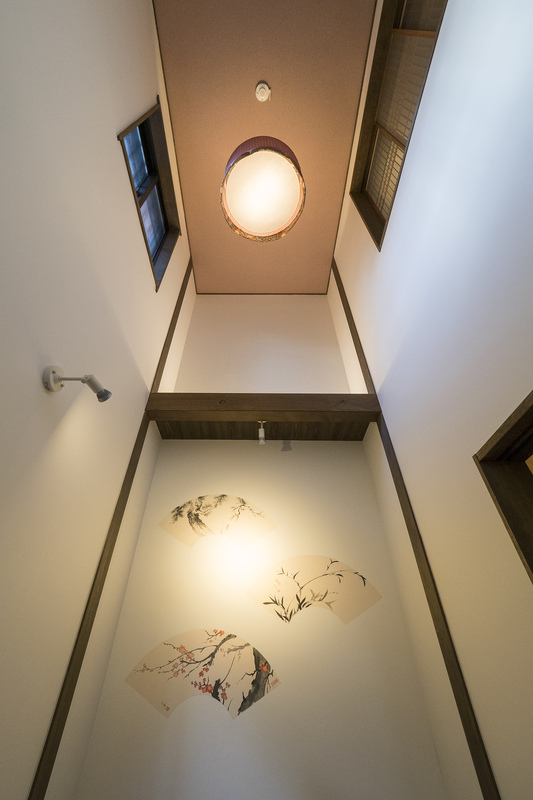 Inspired by traditional Japanese dance The genkan entrance hall is decorated with delicate artwork reminiscent of fans used in "nihon buyo" dance. 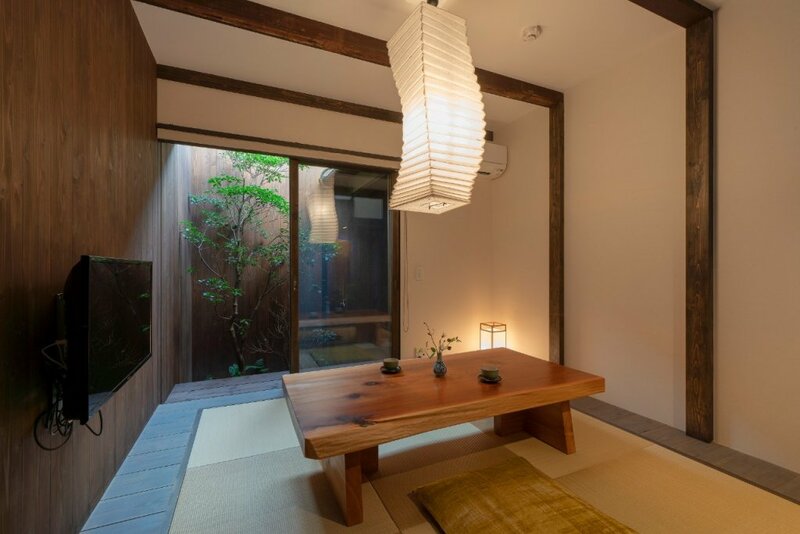 Discover other fan motifs throughout this beautiful machiya. 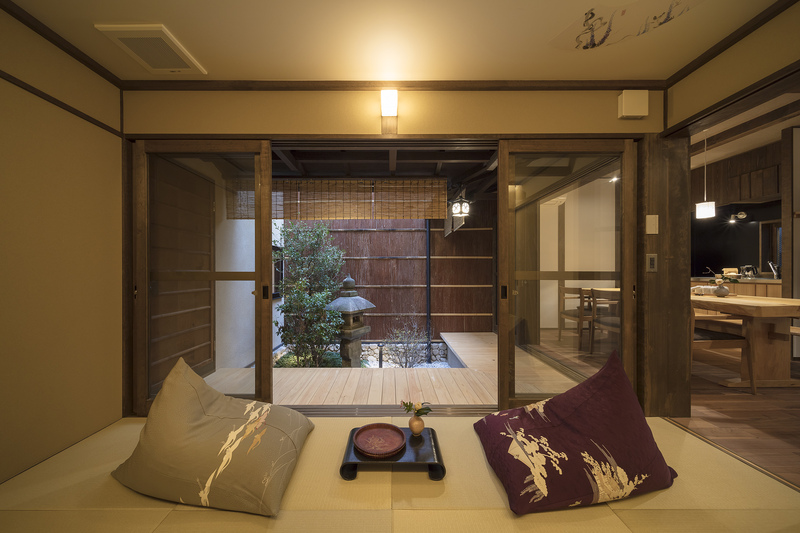 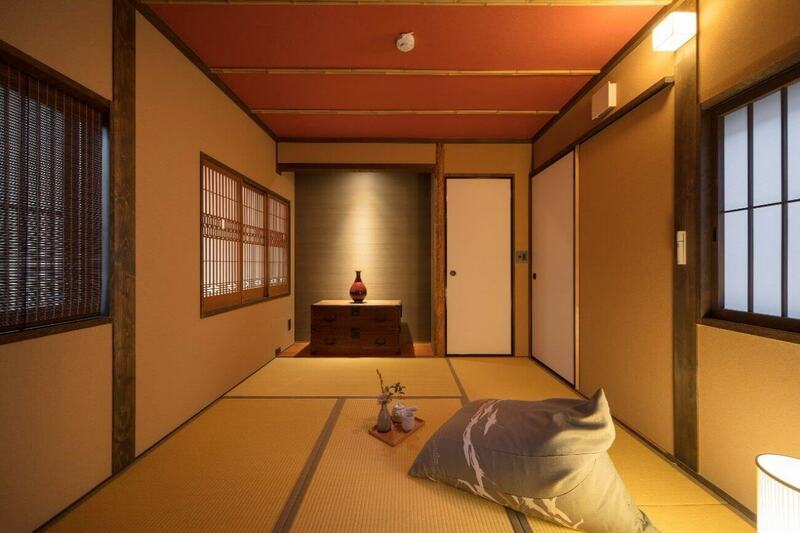 Spectacular inner garden Take in the picturesque garden from the Japanese-style living room, the heart of "Fujinoma". 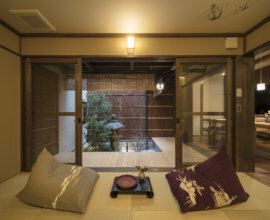 Sit along the veranda with a warm drink to enjoy the sunshine and fresh air. 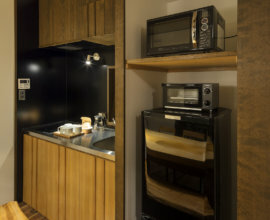 Kitchen and dining room Make yourself at home and have a meal prepared in the fully equipped kitchen. 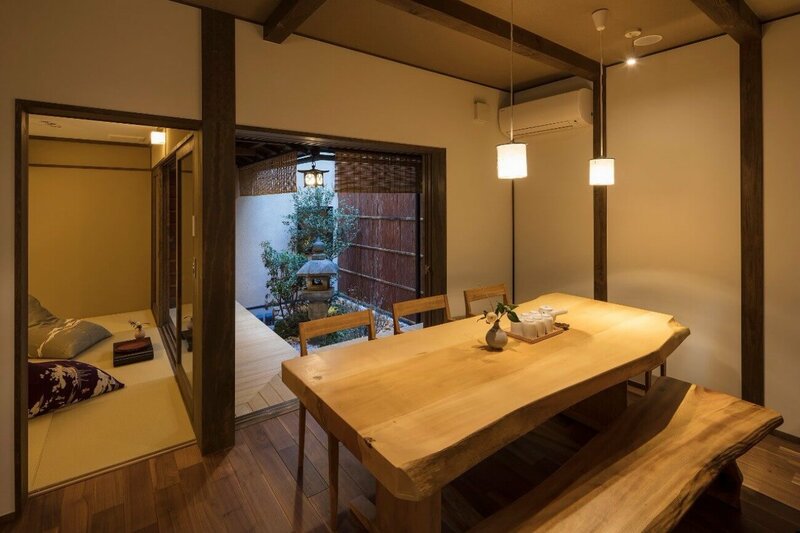 Enjoy a different view of the garden from the gorgeous wooden dining table. 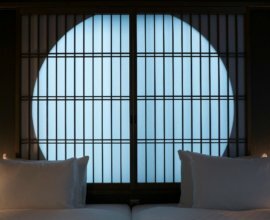 Western-style bedroom With calming deep blue walls and soft lighting from shoji paper lanterns, rest well in this sophisticated space. 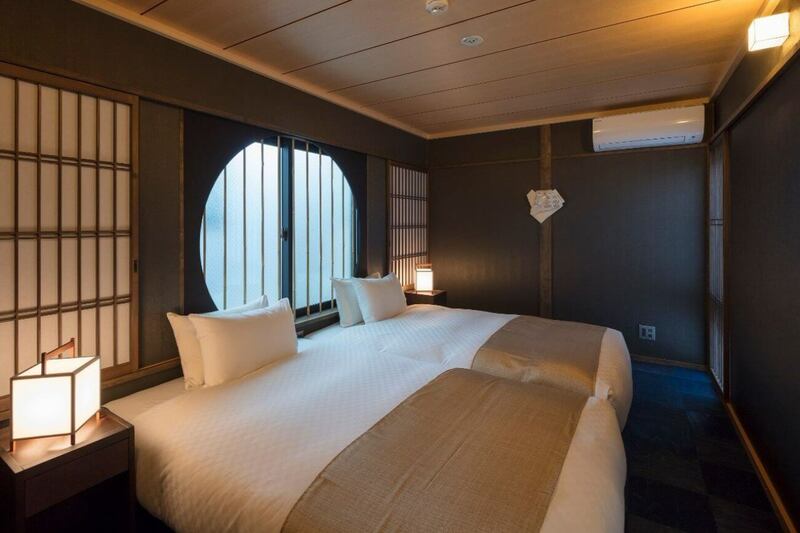 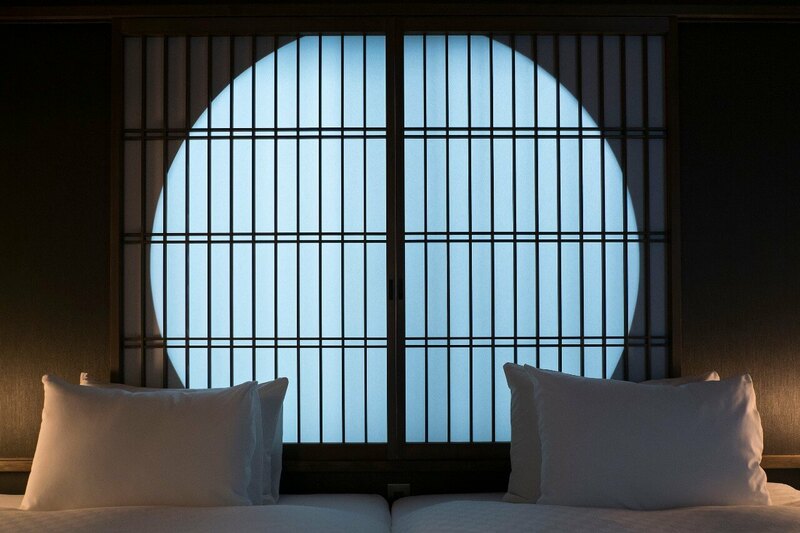 The round window is a special feature of Japanese tea ceremony rooms. 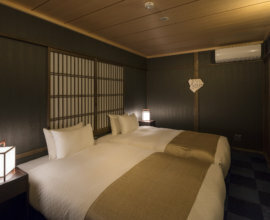 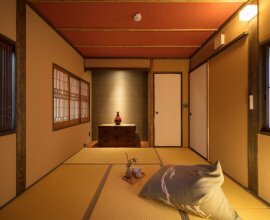 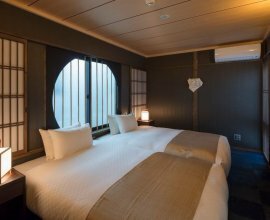 Japanese-style bedroom From the intricate shoji windows to the bamboo details and soft tatami flooring, experience the charm and simplicity of sleeping in a Japanese-style room. 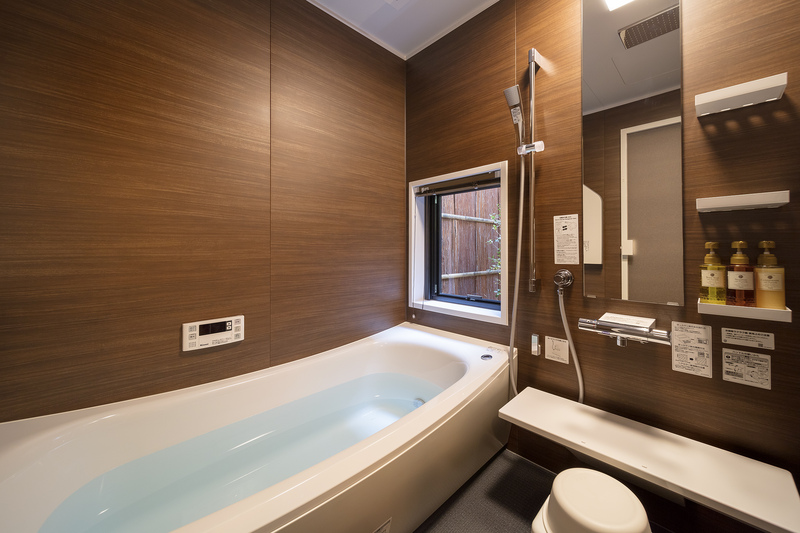 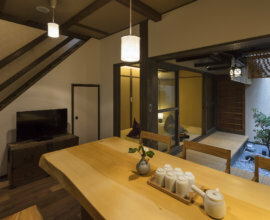 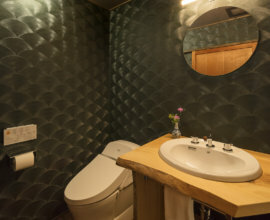 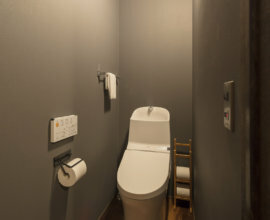 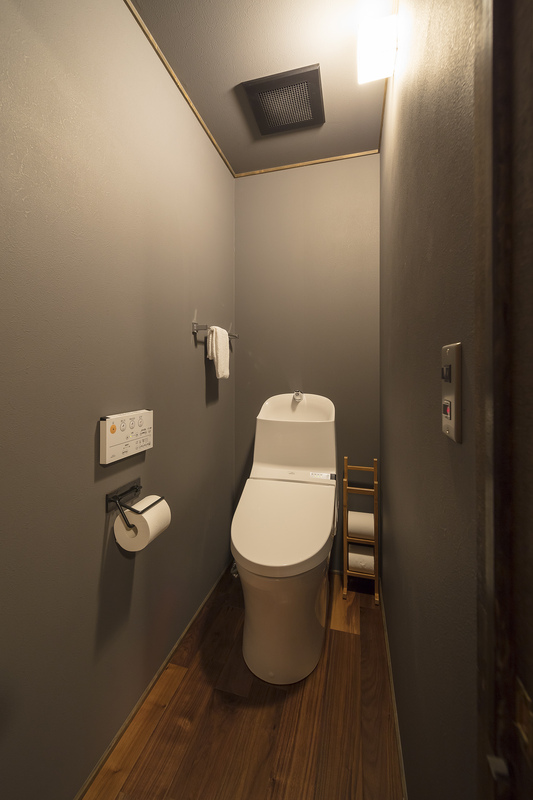 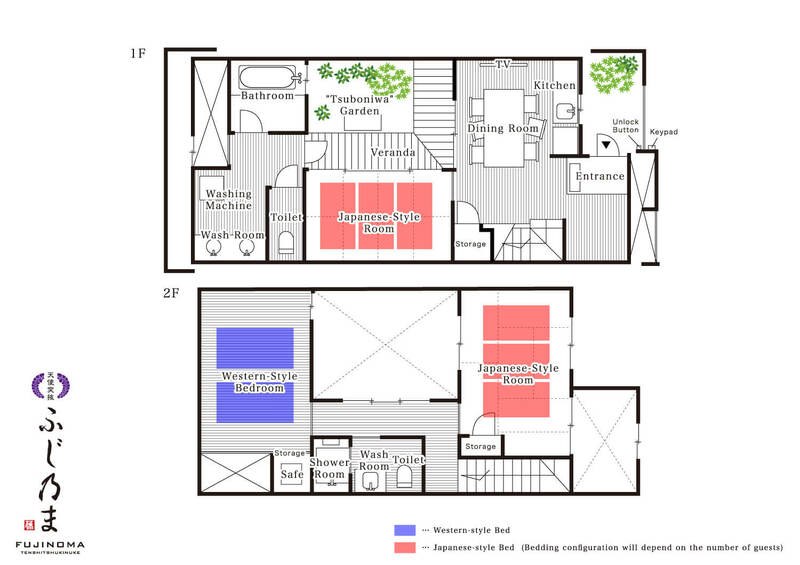 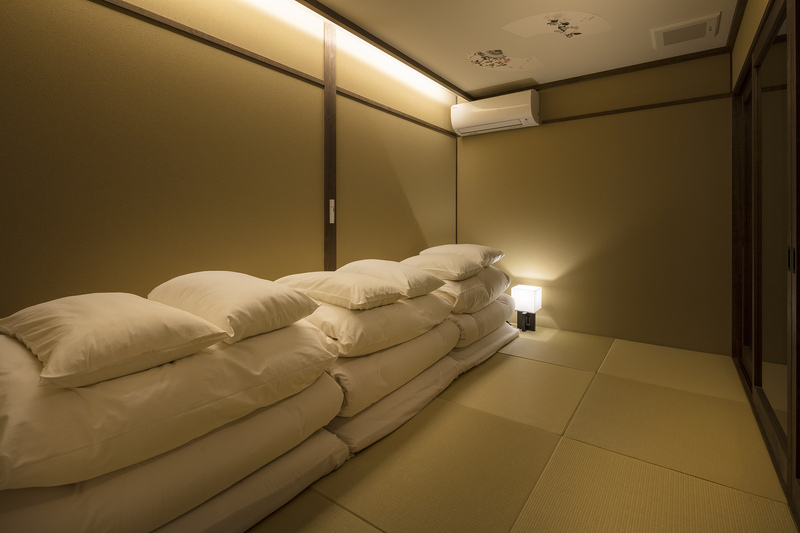 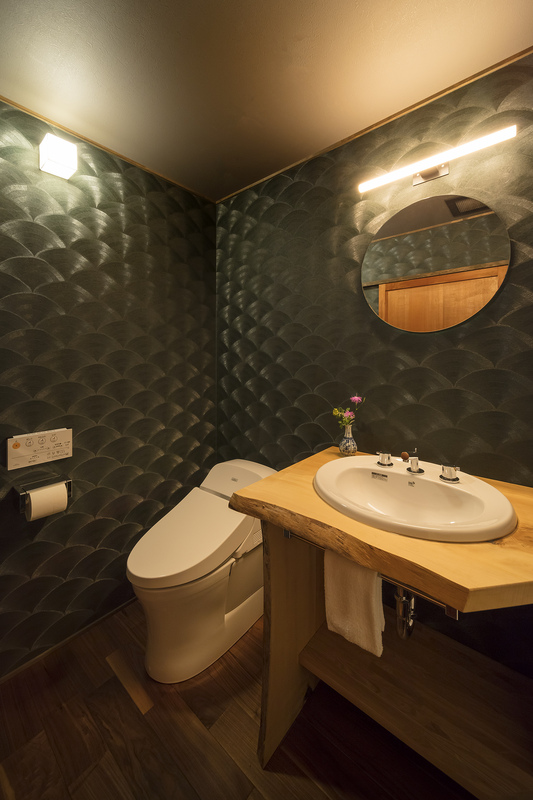 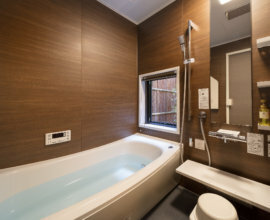 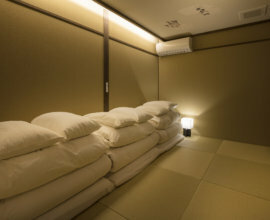 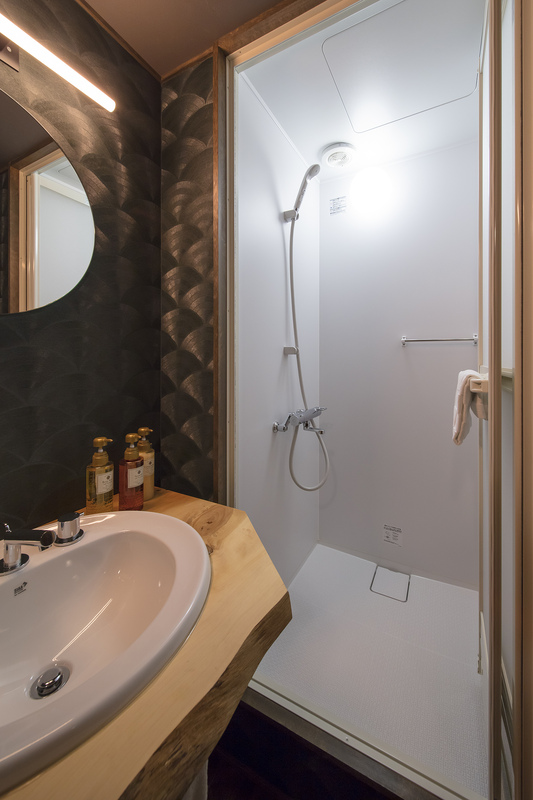 Two bathrooms Along with 1 full bathroom and a double washbasin on the 1st floor, and an additional shower on the 2nd floor, "Fujinoma" is perfect for both small and large groups. 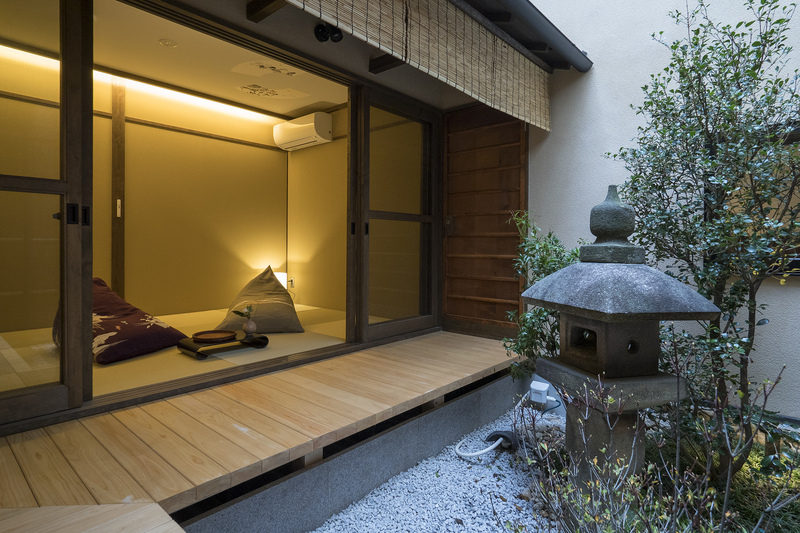 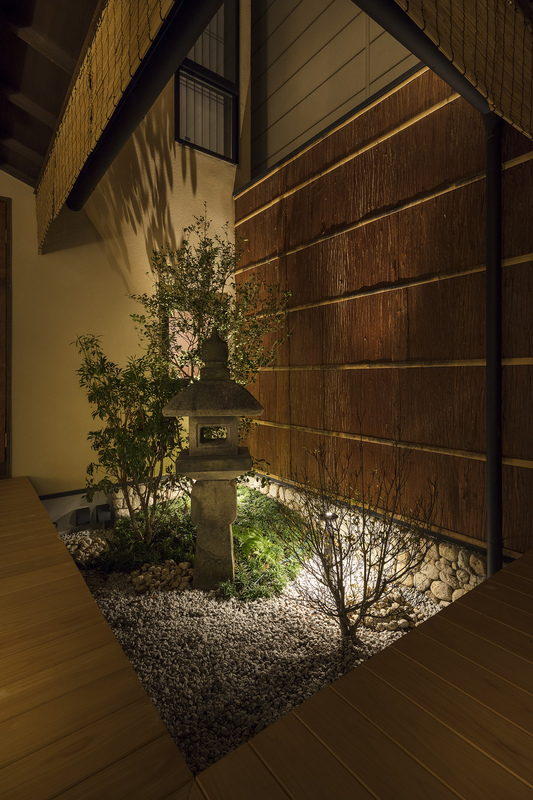 Centrally-located on a quiet residential street, this serene and stylish machiya will allow you to quickly access Kyoto's most famous sites. 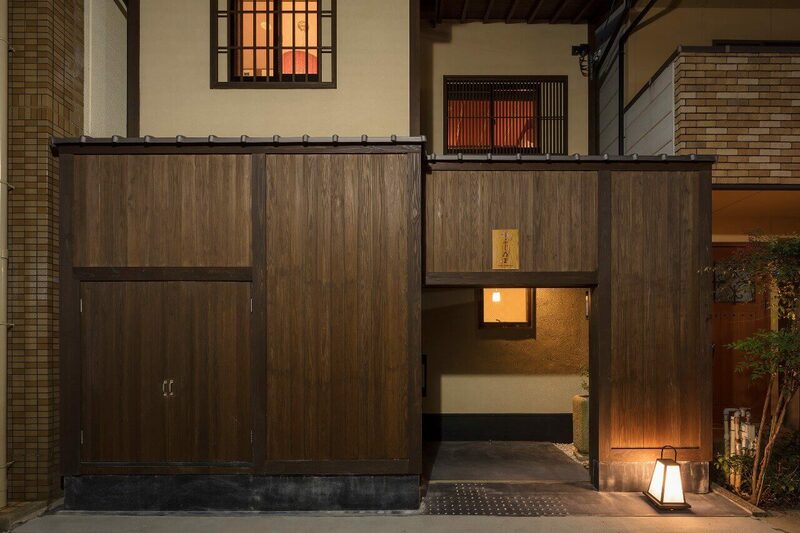 Follow the red-tiled path in front of the house to discover a "shoutengai" - a street lined with shops. 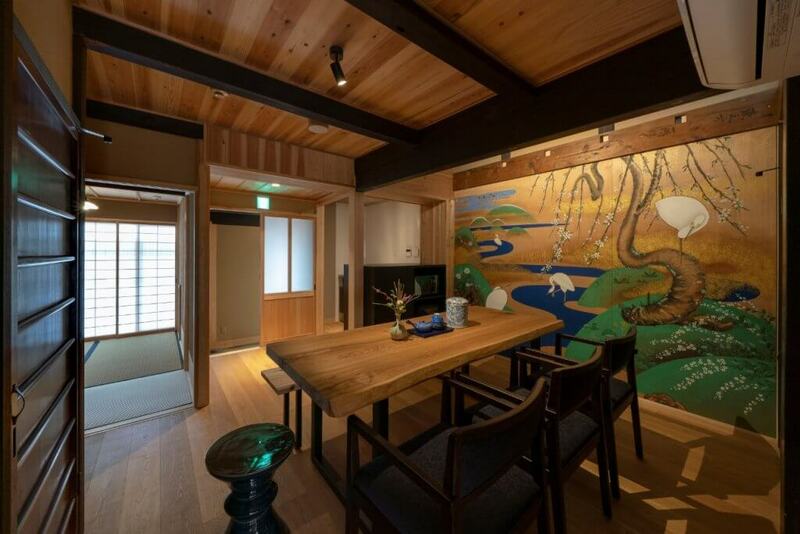 An 8-minute walk along the "shoutengai" brings you to Gojo subway Station. 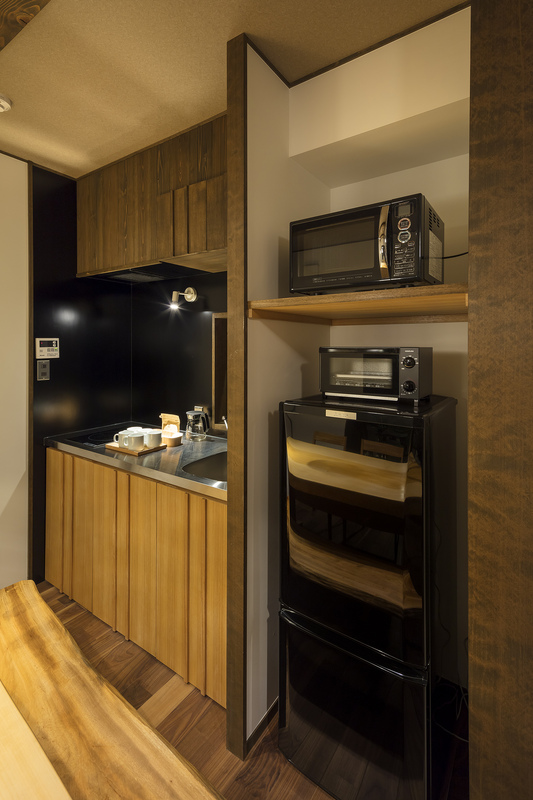 Enjoy convenient access to the main Kyoto Station, just 1 subway stop away. 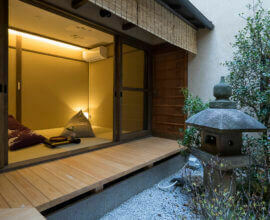 From Kyoto Station, easily reach the popular Kinkakuji and Ginkakuji temples. 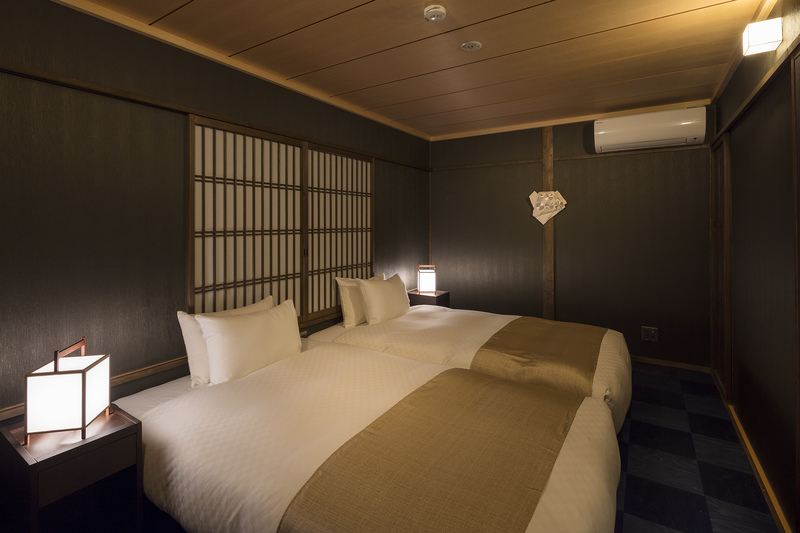 Choose to take a leisurely walk along the Kamo River to reach Gion or the bustling Shijo-Kawaramachi dining and shopping district.